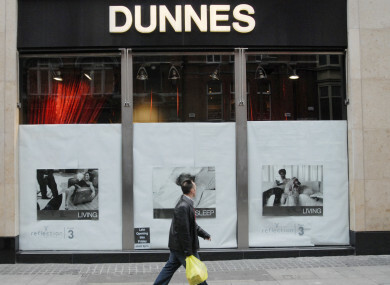 Dunnes Stores has been locked in a planning battle over an expansion at its Newbridge store. IT LOOKS LIKE the mighty ‘Great Wall of Dunnes’ in Kildare isn’t going anywhere soon. Dunnes Stores has been granted planning permission to expand its outlet in Newbridge, adding four new retail units, space for a restaurant and over 400 car parking spaces. This is despite objections from locals, who were trying to get the supermarket giant to tear down a wall dividing Dunnes from the adjacent Newbridge Retail Park. For years, there was open access between the retail park and Dunnes Stores, with shoppers able to easily park in one area and shop in another. However, in September 2015 Dunnes built a concrete wall – that stands at around six feet tall – to separate it from the retail park. The wall was built just days before SuperValu opened a store next to Dunnes. Since then locals have lobbied the supermarket to get rid of the wall, complaining that it is a major inconvenience and a safety hazard that could restrict the movement of emergency vehicles. SuperValu even took matters into its own hands – erecting a large, digital display board that faces into the Dunnes car park and showed its special offers. Although Dunnes stood firm, the issue was raised again when it applied for planning permission through a subsidiary, Castlebrook Investments, to expand the Newbridge site. While considering the matter, some council officials looking at the wall echoed concerns raised by residents. The council’s transport department said Dunnes Stores should get rid of the boundary wall, saying that it was a traffic hazard and restricted the access of emergency vehicles. However, Kildare County Council went against this in its final decision. The planning officer noted that if the wall was to come down, work would have to be carried out on land that did not belong to Dunnes. It found that “given legal issues” and the fact that conditions on development “should relate to land which is under the control of the applicant”, removing the boundary wall “is not feasible”. Kildare County Council’s decision to grant permission for the development was appealed to An Bord Pleanála by Andrew Ross from Newbridge Car Parts, located in the Cill Dara industrial estate opposite the retail park. He again argued that the wall made movement between parts of Newbridge town harder, and also said he did not understand how Dunnes would have legal issues removing the wall if it was able to build it in the first place. However, An Bord Pleanála largely supported Kildare council’s decision. It granted permission for the new development, and there is no mention of removal of the wall in the conditions of its decision. The planning body found that the proposed new development “would be acceptable in terms of pedestrian and traffic safety and would not seriously injure the amenities of the area”. Email “Kildare's famous 'Great Wall of Dunnes' is here to stay”. Feedback on “Kildare's famous 'Great Wall of Dunnes' is here to stay”.